The Asiatic Elephant is the largest living land animal in India, and by far in Asia. Most importantly, elephants help maintain forest and savanna ecosystems for other species, and are integrally tied to rich biodiversity. They are also culturally revered in India and are closely associated with religious and cultural heritage, playing an important role in the country’s history. Although a decline in elephant population has been noticed in recent years, large numbers of sustainable herds still exist – particularly in south and northeast of the country. 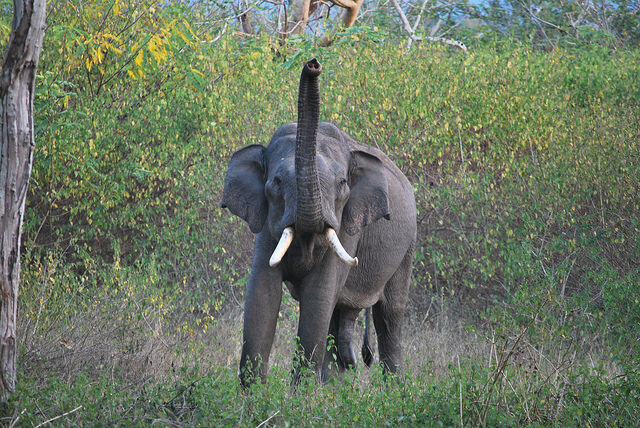 Elephant conservation in India though, has been an uphill task. The Government of India launched Project Elephant in the year 1992 as a Centrally Sponsored Scheme with objectives to protect elephants, their habitat and corridors; to address issues of man-animal conflict; and for welfare of captive elephants. The Ministry of Environment, Forest and Climate Change (MoEFCC) provides the financial and technical support to major elephant range states in the country through Project Elephant. A new addition to this list has come with the official declaration of the Singphan Wildlife Sanctuary as the Singphan Elephant Reserve which got approved by the Government on 16th August, 2018. Singphan Elephant Reserve is the 30th Elephant Reserve in the country and is situated in the state of Nagaland, which has an elephant population of 446, as per recent census report (2017) conducted in the state. An important reserve in North Eastern States, Singphan Elephant Reserve has huge tracts of forest, strategically located in contiguity with the Abhaypur Reserve Forest of Assam which is frequented by moving herds of elephants. Elephant distribution habitat in the state of Nagaland is a continuous stretch starting from Peren district running all along the foothills north – westerly, until it enters Tirap district of Arunachal Pradesh. In fact, the elephants here are found in great numbers. This stretch, which is a traditional elephant bearing area, got broken at various points as a result of which only few elephants are found isolated pockets without having permanent corridor. The creation of this Reserve, hence, will give better protection and conservation of elephants in the state. Nagaland shares the international border with the country of Myanmar, on the east side. It borders the state of Assam to the west, Arunachal Pradesh and Assam to the north, and Manipur to the south. The state boasts of lush green forests, rolling mountains, enchanting valleys, swift flowing streams and wonderful landscape – and has dazzling hills and valleys, lying along the edge of Myanmar. The altitude varies from 194 meters in the plains to 3,058 meters in the hills.. The Singphan Elephant Reserve is located in Mon district of Nagaland and spreads over an area of 5,825 acres (2,357 hac). It lies in the North-western part of the State of Nagaland, where the altitude varies from 200 to 672 m (msl). The Singphan Elephant Reserve is located at about 65 km from Mon, the district capital town of the State. This forms an important forest connecting the fragmented and isolated patches of forests in the States of Nagaland and Assam. The declaration of the Singphan Elephant Reserve in the State of Nagaland will boost the elephant conservation in the country, especially in the north eastern region. The creation of new Elephant Reserve will facilitate in the conservation strategies that the government must employ, so that the remaining population is not put at risk, and cared for adequately. The Indian sub-continent is considered to be the last remaining stronghold of the Asian elephants. With more than 26,000 elephants, it is home to more than half the global Asian elephant population in the wild. Considering the socio-cultural importance elephants hold in India, they also have been given the tag of National Heritage Animal. It becomes imperative for us, as a country, to preserve the species and nurture them, both as a cultural and moral obligation as well as an ecological necessity. NextThe Concretization of Trees, Or That of Non-Compliance?